Oct 1, 2018; Denver, CO, USA; Denver Broncos cornerback Bradley Roby (29) against the Kansas City Chiefs at Broncos Stadium at Mile High. Bradley Roby admittedly had a rough game Sunday against the New York Jets, but he said he wasn't playing hooky from work Monday, but rather he was ill, and the chain of communication broke down. 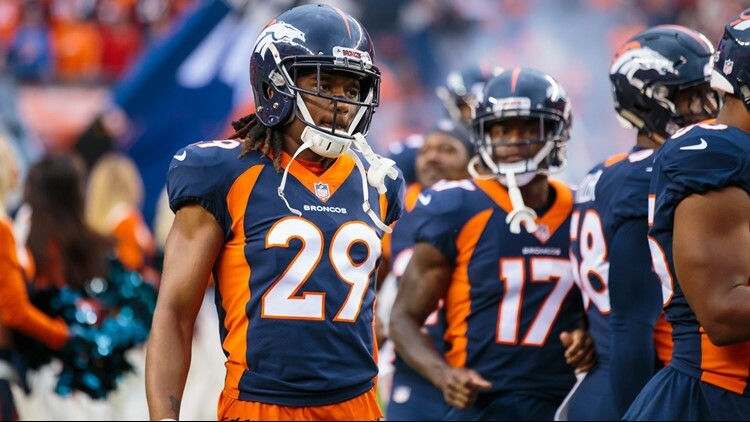 ENGLEWOOD — The Broncos slapped cornerback Bradley Roby with a hefty fine because of his absence from team headquarters Monday, a source told 9NEWS. Roby admittedly had a rough game Sunday against the New York Jets, but he said he wasn’t playing hooky from work Monday, but rather he was ill, and the chain of communication broke down. Roby was at practice Wednesday and Broncos head coach Vance Joseph said he would play Sunday against the Los Angeles Rams. "It was more about communication than a total miss, but it's been fixed and handled internally,’’ Joseph said. Roby said the frustration from getting burned twice for touchdowns while trying to cover receiver Robby Anderson was not the reason why he didn’t show up Monday until later in the day. Roby admitted the transition from No. 3 cornerback the previous four years to starting corner this year has not been without challenges. With Marpet deal, what about Paradis? Tampa Bay just gave Ali Marpet, a left guard this year but a center last season, a five-year, $55 million extension. Marpet is in his fourth season who had the leverage of free agency at season’s end. Matt Paradis, in his fourth year as the Broncos’ starting center after spending his rookie season on the practice squad, is also a free agent come March. The Broncos and Paradis’ representatives had contract talks prior to training camp but there doesn’t appear to have been much progress since. The center market is somewhat scrunched with the fifth-highest paid, Atlanta’s Alex Mack and Seattle’s Justin Britt, averaging $9 million a year. San Francisco’s Weston Richburg is the third-highest paid at $9.5 million per. Tampa Bay’s Ryan Jensen, who grew up in Fort Morgan, is the No. 1 compensated center at $10.5 million a year. Broncos receiver Jordan Taylor finishes his first six week period on the physically unable to perform list. Come Monday, he can start practicing. The plan is for Taylor to start with half-speed individual drills. He has 21 days before the Broncos must decide whether to activate him on their 53-man roster or keep him on PUP. The Broncos have a bye week after the 21-day period so they can buy a little bit more time. The Broncos signed former Boise State running back Jeremy McNichols to their practice squad Wednesday. McNichols rushed for 43 touchdowns and more than 3,000 yards in his final two years for the college Broncos. He was drafted by Tampa Bay in the fifth round last year and wound up playing in two games with the San Francisco 49ers before getting two carries for 4 yards in a game for Indianapolis this year. McNichols replaces David Williams, who was signed off the Broncos’ practice squad earlier this week by Jacksonville.